Olympic snowboarding champion Ross Rebagliati wants to hit gold again with plans to open a medical marijuana business and retail store in Whistler. Rebagliati wants to sell medical marijuana and marijuana-related items through government-licensed franchises called “Ross’ Gold,” according to his business website. He told CBC News on Wednesday that the business is jumping on changes to Canada’s medical marijuana laws. In December, Health Canada announced the government will no longer grow and distribute medical marijuana, allowing companies that pass strict rules to take over. “Our main goal is to change the face of the marijuana dispensary from the current model of being sort of like a hole in the wall down the street somewhere,” he told CBC, adding that he envisions an environment similar to what Starbucks has created for its clients. The first store, with a coffee shop and a doctor’s office to issue medical marijuana prescriptions, is planned for Whistler later this fall, followed by others in Toronto and Vancouver, reported The Province. Rebagliati says a dispensary would be in the back where minors are not allowed. According to an online business plan, Ross’ Gold expects to bring in $5 million in revenue from retail sales and franchise fees, as well as $50 million in medical marijuana sales by the third year. There are also plans for the company to go public. Ross’ Gold could also apply to provide legal marijuana to the public if the drug is ever legalized in Canada, as it has been in Colorado and Washington state. 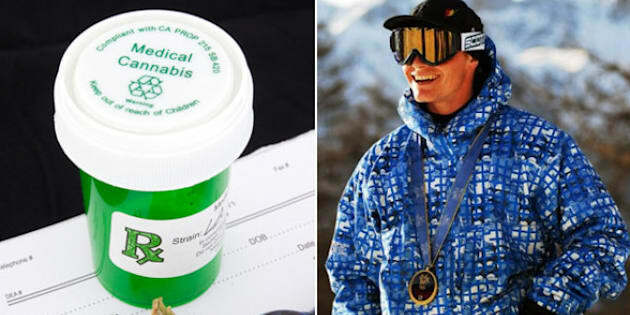 Rebagliati briefly lost his gold medal at the 1998 Winter Games in Nagano, Japan after marijuana was found in his system. The decision was overturned as pot was not banned as a performance-enhancing drug at the time. Rebagliati claimed that the pot came from exposure to second-hand smoke. "It is the hand I was dealt 15 years ago. I can't get away from it," he told The Vancouver Sun. "So I decided if you can't beat 'em, you gotta join 'em." There are more than 21,000 Canadians who are currently authorized to access medical marijuana, but Health Canada says that number is expected to jump to more than 300,000 in the next decade, said the Sun.